Did the command in Romans to obey the government justify separating families? Q. Attorney General Jeff Sessions got the whole country discussing the Bible when he quoted from Romans, “Let everyone be subject to the governing authorities, for there is no authority except that which God has established,” to defend the Trump administration’s policy (now discontinued) of separating the children of migrants from their parents. Was that a valid argument? I’ll address the interpretation of that passage in Romans shortly. But let me make a preliminary observation first. 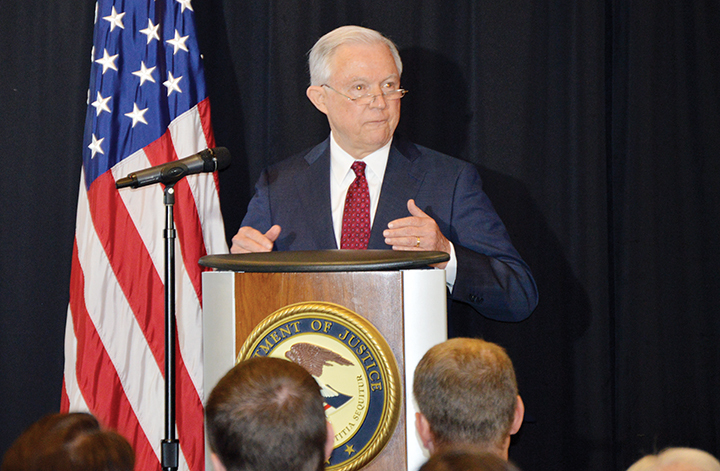 We can see that Sessions was trying to counter criticisms of the government “separating families” on the grounds that by doing this, it was prosecuting those who “violate the law.” As an aside of my own, I would observe that it’s an open question whether a person who enters a country without prior authorization specifically to request amnesty is breaking the law. But for the purposes of argument, let’s assume that it is. A government’s responsibility to enforce the law doesn’t give it the right to use any punishment it wants. The U.S. Constitution itself forbids “cruel and unusual punishments.” The question then becomes, what does the Bible say about the punishment that Sessions was defending for such cases? The New Testament says that these words were “fulfilled” (that is, they took on a further meaning in light of later events) when Herod executed all the baby boys in Bethlehem in an attempt to kill Jesus. So in terms of family separation as a sanction, the Bible identifies Jesus with those who have suffered this punishment, not with those who would inflict it. It portrays the anguish that it causes, rather than celebrating those who use it to control populations. So I would say, to begin with, that it was not valid for Sessions to appeal to the Bible to support the punishment he was defending. As for the passage in Romans itself, while Sessions stated that it taught that God has ordained the laws of government “for the purpose of order,” it actually says that “the one in authority is God’s servant for your good.” The Greek term is agathos; it’s also translated “welfare” or “benefit,” or “to help you.” In other words, the government is given power under God not to keep everyone in line with the way it wants things (to maintain “order”), but to promote the welfare of everyone under its control. Everything begins with God wanting good for people; God then creates governments as His agents to promote that good. While not stated explicitly in Romans, the implication is that when governments fail in that responsibility, and particularly when they oppose what is good and become destructive of it, then God’s people no longer have an obligation to obey. Instead, they have a responsibility to disobey as a loyal protest, in order to call the government back to fulfilling its rightful role and original mandate. A single verse of Scripture never contains the whole counsel of God. We must consider the teaching of the entire Bible on a given question in order to understand the answer to that question in a full and balanced way. And the Scriptures provide numerous examples of people who resisted and disobeyed their governments in order to be faithful to God’s purposes. These examples are informative, and they fill out the picture provided in Romans. Jesus himself was accused on many occasions of breaking the law, for example, when he healed on the Sabbath. His response was that it was lawful on the Sabbath to do “good.” In Mark and Luke, this is the exact Greek term that Paul uses in Romans (agathos); in Matthew, it’s a synonym (kalōs). Either way, the argument is the same: God’s desire to do good for people comes first; laws come second, to support that. When the Jewish government authorities forbade the apostles from speaking about Jesus, they continued to do so anyway. When the authorities arrested them and demanded to know why they’d done this, the apostles responded, “We must obey God rather than any human authority.” So according to the Bible, obedience to government is not an absolute, unconditional obligation. Instead, God’s people have a responsibility to hold the government accountable for fulfilling the purpose for which it has been constituted, which is to promote the welfare of everyone under its control. By this test, the policy of family separation was not a biblically valid exercise of government authority. We may note, finally, that the apostle Paul, who wrote in Scripture that everyone should be subject to the governing authorities, was himself executed by the Romans as a lawbreaker. The charge was that he was promoting loyalty to Jesus rather than to Caesar. Previous Previous post: Was Jesus a legal or an illegal refugee?